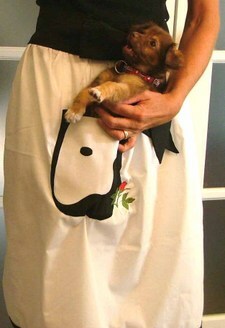 2 posts categorized "Tie One On"
The June/July Tie One On theme is Apron, the Musical. 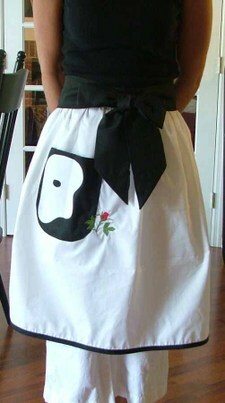 The challenge was to make an apron based on a musical. My submission is Phantom of the Kitchen, a very appropriate apron for someone who likes to make only brief and somewhat shadowy appearances in the kitchen. Madden fits nicely in the pocket but he's way to busy to spend any time there. Here is my first apron. The tie one on theme for January is apron from old clothes. So I dug through the bag in the trunk of my car waiting to be delivered to Goodwill. I pulled out a pair of khaki pants and a light blue cotton shirt. Here is a picture of the pants and shirt. I was so excited about getting started once I had an idea in mind I nearly forgot to take a picture of the clothes before. I cut the legs off the pants and removed the zipper but left the waistband. I hemmed the sides and bottom and attached the light blue lace trim from the hem of the shirt. The pant pockets had a flap and button and I removed that. I cut the area with the embroidery and tucks off the shirt and ironed them onto the pocket using fusible web. I made a belt out of the shirt fabric. I love it and it was fun to create! It will definitely be the first of many aprons! Here is a view of the back. Hey I have had a few visitors today and no one said hello! If you are visiting tell me hi!